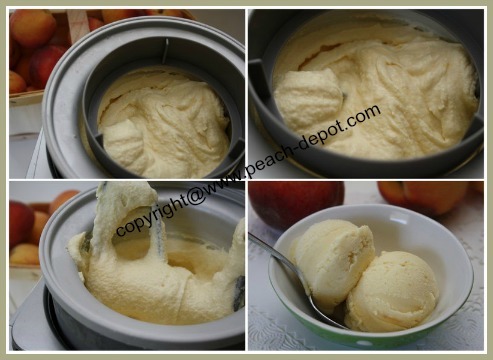 This Recipe for Peach Ice Cream using an Ice Cream Maker Machine makes a scrumptious, fresh tasting, flavorful frozen dessert with peaches! 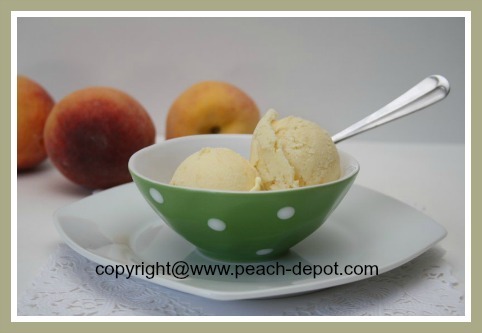 A Peach-depot.com original recipe! 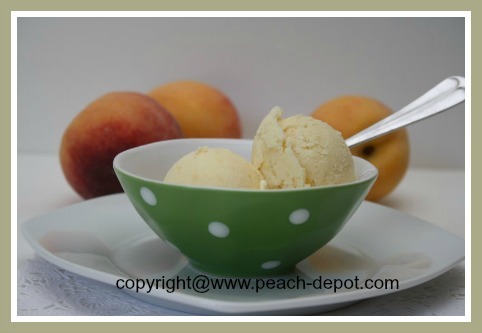 I made this recipe with my fresh, local peaches and this peach ice cream is second to none! So yummy! 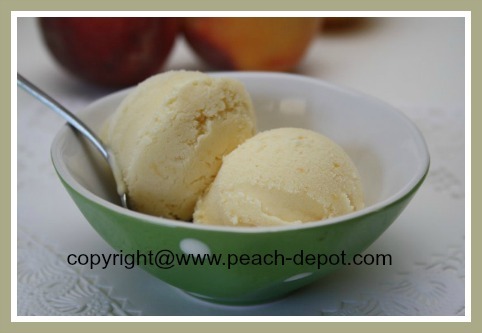 Best Homemade Peach Ice Cream Recipe! I made a double batch, and kept one-half of the mixture in the fridge until the Ice Cream Maker canister was fully frozen again (a couple of days after processing the first batch) and then processed the second batch ... worked great! 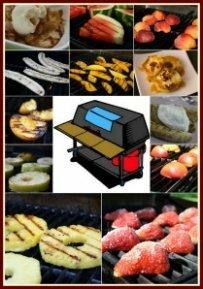 If you do not have an Ice Cream Maker, scroll down for the link for easy directions for how to make your own ice cream withOUT an Ice Cream Machine. 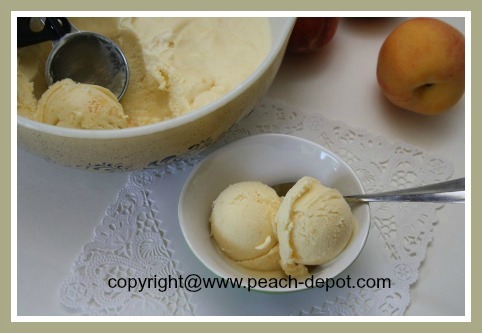 Note - peaches which are ripe, but not over-ripe and mushy make the best ice cream. In a small pan, over low heat combine the sugar and the water until thoroughly dissolved. Bring mixture to a boil over medium-high heat, stirring often to avoid sticking and burning, then remove from heat. Add the hot water and sugar mixture while continuing to beat until well combined. Return the mixture to the pan and stir over low heat, until the mixture thickens, about 4 - 5 minutes, but DO NOT allow mixture to boil. (If you have a food thermometer check that the temperature reaches 160 ° F). Use a sieve to strain the egg mixture into a clean bowl and allow to cool thoroughly, otherwise the mixture will be too warm for the ice cream maker, causing the canister of the ice cream machine to warm before the ice cream is finished processing). Using a food processor or a blender, puree the peaches in batches, and stir the pureed peaches into the egg mixture. Stir in the whipping cream, half-and-half cream, vanilla extract and the salt, and mix well. Pour the mixture into the freezer canister of the ice cream maker, and process according to the manufacturer's directions (for my Cuisinart Ice Cream Machine it took about 25 minutes). Transfer ice cream to a freezer safe container and freeze for at least 12 - 24 hours before serving. 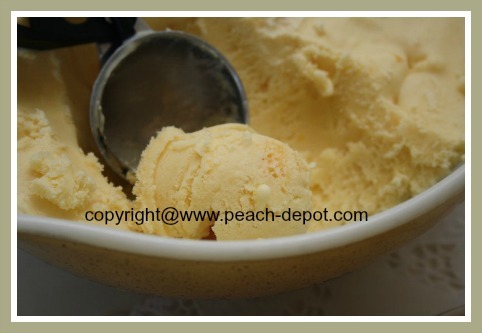 Makes about 2 quarts of the BEST EVER Real Peach Ice Cream! Ice Cream Making supplies and recipe books can easily be purchased online at *Amazon.com, and, in most cases, be delivered right to your kitchen! 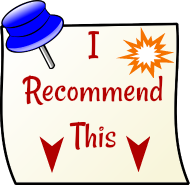 The third product below is the Cuisinart Ice Cream Maker I have, and I HIGHLY recommend it if you are looking for a great ice cream machine. Peaches not only taste amazing, but peaches are very nutritious too! Peaches contain numerous valuable minerals and vitamins. Peaches are a good source of Vitamin C. Vitamin C helps the body develop resistance against infectious agents and helps the body fight harmful, free radicals. Peaches are also good sources of Vitamin A, Beta Carotene, Potassium, Floride and Iron. This delectable fruit is also high in antioxidants.